Maui is the second largest of the Hawaiian Islands and should be added to your bucket list IMMEDIATELY! Maui has a very laid back vibe, incredibly nice people, and many outdoor activities...oh, and did I mention it’s BEAUTIFUL!?! It is also the perfect size as it has different town options on where to stay and what kind of places to see, but you can still see the whole island in just a few days. We had the amazing opportunity to visit the island for five days and… boy oh boy, was it incredible! Flying to Hawaii can definitely be very expensive, and it is something you have to plan ahead for. We were very lucky and found decent prices on tickets about $500/pp (I should add we went in January during the off-season) and flew a direct flight from Los Angeles to Maui on American Airlines. The flight was about five hours long. From the airport – Many hotels offer shuttles from the airport, or you can also buy separate tickets on private shuttles to get to wherever you are staying. My biggest advice to you guys is to rent a car! It makes everything easier and allows you to visit the whole island on your own time. Around the Island – As I just mentioned, best thing to do is rent a car if you actually want to drive around the island! However, if all you wanna do is sit back and relax on the beach, you can perfectly rely on taxis and free shuttle rides in the resort area of Kaanapali to Lahaina. We actually didn’t rent a car until our third day there. There were some car renting options a short drive from the hotel, and the whole process was very quick, easy, and convenient. We rented a Jeep Wrangler, and it was perfect. When picking out your accommodation, it all comes down to what you are looking to do on the island. We stayed in the Sheraton Maui, which is located in Kaanapali on the west side of the island, and it was about a 50 min drive from the airport. Kaanapali is a resort area where you can disconnect from everyday shenanigans and just sit back and enjoy your vacation. There is a beachwalk that strolls around all the resorts, restaurants, and cafes so you don’t even have to worry about calling a cab. Overall, the resort was even better than we expected! (We usually try to stay in small hotels, but the resort was a great experience.) There were nice eating options, very comfortable rooms, and the beach is gorgeous! If you are planning a stunning resort destination, look no further! Also, the small and lovely town of Lahaina is just 15mins away from the resorts in case you want to escape the resort life for a bit, eat somewhere else, and do some shopping! That being said, after we explored the island, we realized that you don’t truly get the local feeling of Hawaii in Kaanapali, and we will try to stay in another area of the island on our next visit, such as Paia, Kihei or Hana. We loved each of these small towns! They were very low-key and, in my opinion, much more Hawaii. 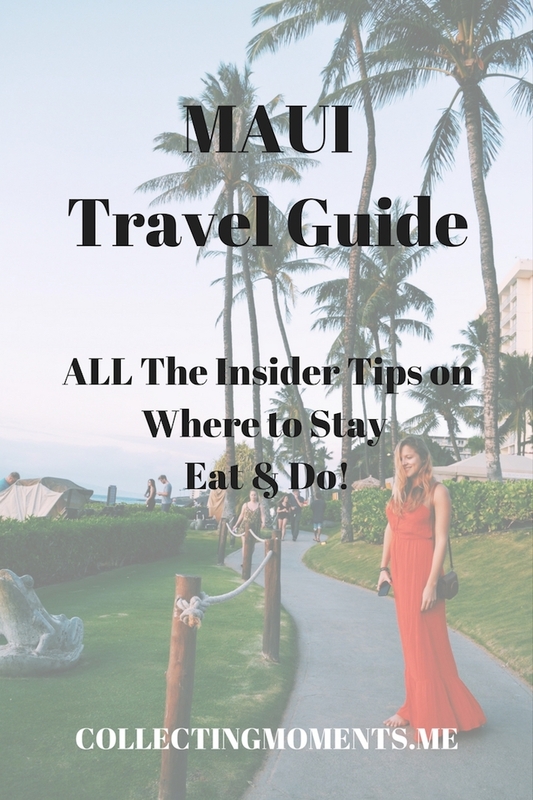 Paia – This is definitely at the top of the list on where we want to stay on our next visit! It’s a small hippie town in the northern coast of Maui and the last town before heading on your two hour adventure to Hana. Paia has a few blocks of local restaurants and boutiques. It’s only 17mins away from the neighboring town of Kahului, where besides the airport there is a Costco, Whole Foods, and the familiar food chains. Also for all my surfers out there - the famous surf spots of Ho’okipa and Jaws are about 3 miles away! Hana – Hana, Hana, Hana… The road to Hana was by far my favorite experience out of the whole trip, and that is why I dedicated a whole post to it! Accommodation-wise, it is very remote and a place to truly connect with nature. Kihei – We only stopped at Kihei for a quick bite before heading to the airport on our last day on the island. Still, we really liked the vibe in town. It seemed more like a chill Hawaiian style suburb and just a nice place to look into staying. Whalers Village – This is a small shopping center with boutiques and restaurants. There is a food court that is ideal to grab a quick lunch where we ate poke, and it was so goooooood! Hula Grill Kaanapali – This is also located in Whalers Village. It is a very typical tropical vacation theme restaurant, and we liked it! They have two seating areas: a laid-back bar area with live music and a dining room. We ate during their happy hour in the bar area, and it was fun. We had the coconut shrimp, a flatbread, and the firecracker sandwich, and they were all very yummy. Live music was awesome. Castaway café – This restaurant is a located on the beachwalk in Kaanapali, and it’s about a 20min walk from the Sheraton Maui. They had all types of American dishes with an island feeling to them. We had calamari, the catch of the day, and some cocktails; it was all very tasty. The crowd of this place was more family oriented and lots of older (may I say retired?) folks. What a bad life! Nalu’s South Shore Grill in Kihei – This restaurant is located in the town of Kihei, and it was delicious! It has a very chill vibe, with wide spaces and a cool beach décor. The staff was very friendly and hip, and they serve a variety of fresh foods from açai bowls to delicious sandwiches. 1. Rent, or even better, bring your own snorkeling gear and see the amazing sea turtles and diverse fish. 3. Visit the town of Lahaina – It’s a quaint town with lots of history. There are shops, restaurants, and the amazing Lahaina Banyan Court Park. 4. Nakalele Point – see the amazing blowholes shoot water as high as 100 feet up in the air. 5. Honolua Bay – It’s a famous surf break where you can see some surfers ride some rad waves. The drive there is pretty cool and the view spectacular! 6. Road to Hana – Venture out to Hana and stop at all the cool spots along the way. 3) Watch the sunrise from Haleakala –The view of the sunrise from the volcano is supposed to be breathtaking. Just make sure to wear plenty of layers, as it is very chilly in the early AM. 4) Visit Makena and spend my Sunday evening in Little Beach – on Sundays people gather around and play drums, and it’s supposed to be a lot of fun with a crowd of locals, artists, and tourists.